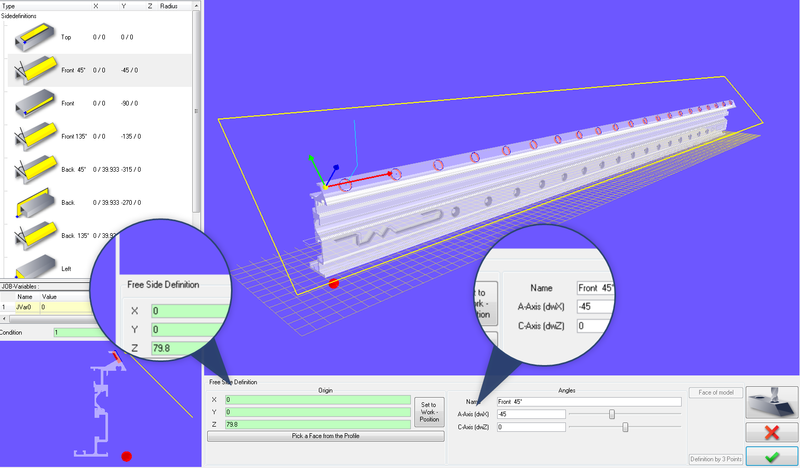 camQuix® is a modern CAM software for aluminum profile milling. Our experience from the last 20 years and constant development according to the latest standards of all the various machining centers have made camQuix a powerful and convenient tool. camQuix enables the automatic direct control of all your CNC machines as well as communication with peripherals. Within the clear structured user interface, you manage your entire CNC-machine park and your complete customer orders. Program different profile types and profile lengths target-machine-independent in a clear 3D graphic display. camQuix optimizes, among others, either machine- or project-related the loading positions of entire profile bars or profile cuts. Manage all your profiles within an intelligent data base and save repeating works as custom macros. camProx provides furthermore cadXtract interface. cadXtract converts your 3D CAD-drawings into CAM-readable data automatically and it is of course fully compatible with camQuix. In camQuix, every work may be processed as a standard work, for example drilling, slot, rectangular pocket. However, free contours save production time and provide for high quality results. Especially for the production of free millings, camQuix is easy to use. Complex milling movements can be imported from DXF drawing lines. Tool radius compensation is automatic (G41/G42). What is really special about free milling is the ability to parameterize complex works. That means that every free contour can be defined via variables and saved as a macro. If the work has to be made again, it’s sufficient to change the values of the variables.